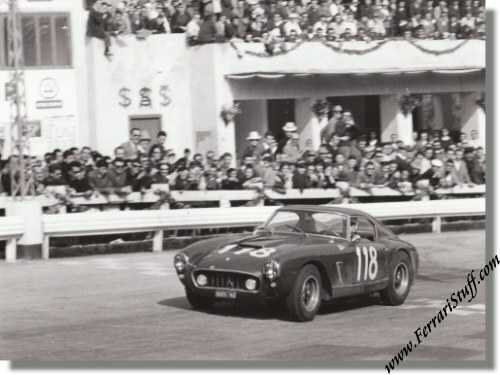 Vintage 1963 photo of Ferrari 250 SWB Berlinetta S/N 1791GT at the Targa Florio. This is a GREAT shot of Vito Coco in his Ferrari 250 SWB Berlinetta Competizione S/N 1791GT during the 1963 running of the Targa Florio. Apparently, Vito sold the car between 1964 and 1966 and after that the history is somewhat clouded. This is a vintage photo, i.e. it was printed shortly after the image was captured on film. The photo measures some 9.5 x 7 inches or 24 x 17.5 cm, is in excellent condition and carries the photographer's stamp on the back.